Fustic and Indigo green is The Best. This shade of green makes me slap my face a la Macaulay Caulkin and rather than scream, I kind of just go “eughaaargh” and make other nonsense noises because words just cannot explain how good it is. Growing up in Australia I’m used to seeing stereotypical images of our bush (that’s Aussie for forest for any international readers), the ones where the ground is brown, the tree is brown, and the leaves are a dull greenish silver, or just army green. It does have it’s beauty and if you’re an art fan, please go look up John Glover. He’ll make you slap your face a la Macaulay as well. For most of my life I have always found green rather boring, unless it was a beautiful foreign forest green, the kind I have never seen a great deal of living here. So imagine my incredible delight when I thought to myself “perhaps I will try a green” and stumbled upon this loveliness. Since I have it has opened my eyes to it in the Australian landscape too. Now I see it everywhere. It flashes out at me like little emerald gems that were once secreted away because to see them always would tarnish their beauty. I know I say this about every colour, but I think it’s my favourite. It is however a harder colour to achieve. Well, it’s not really hard per say, it’s just that it takes longer to achieve, because you have to dye your textile twice. 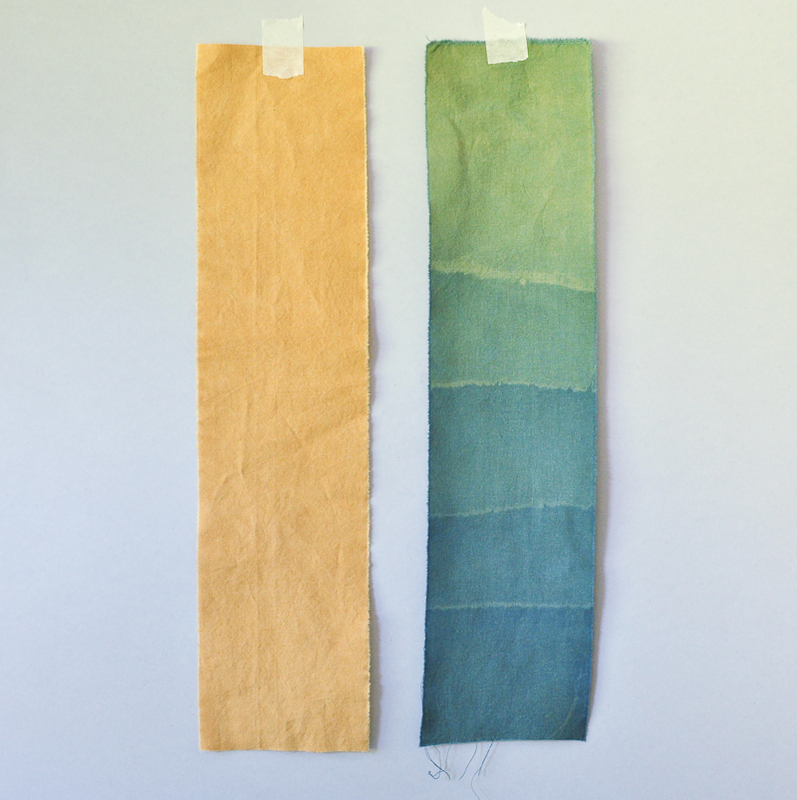 In the world of natural dyes that means in whatever order you choose to work, you effectively dye your work three times, because fustic requires a mordant first. 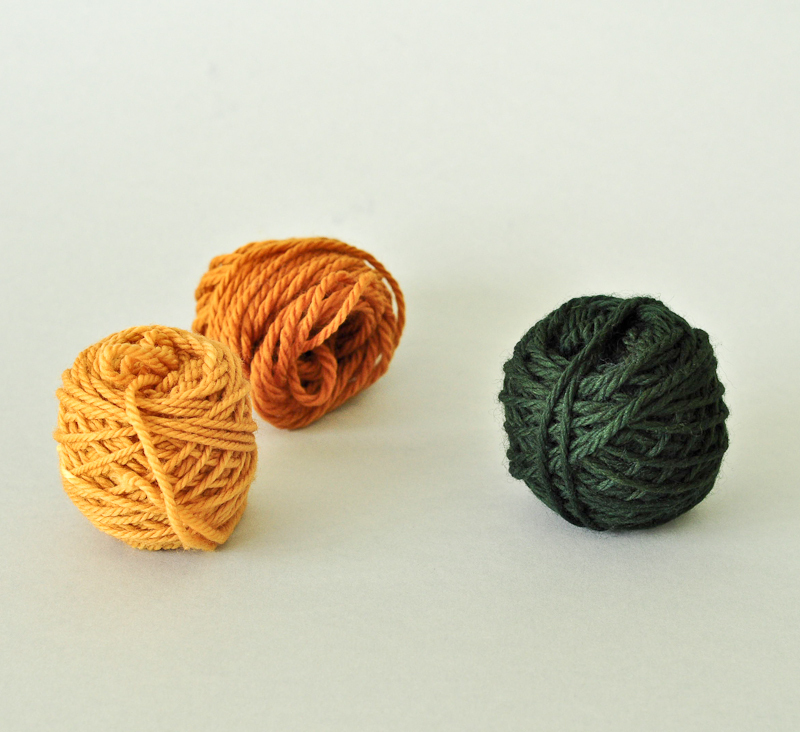 If you want to do it on cotton, it means 3 mordants and 2 dye jobs! That is just crazy, what kind of lunatic would spend that much time dyeing something? A rather washed out Indigo dye test. Ah the possibilities! I just found your indigo entry on a search for “indigo troubleshoot hydros”. Yes! the two cup solution sounds great. And I’m also hoping that the 12 dips will get me to a darker place – I had been thrilled by my first dunking into a very strong vat, but have had the sneakiest feeling that perhaps the blue was going backwards instead on subsequent ones. Will persist. However – I normally wouldn’t get to an email stage mid-dyeing frenzy – but I saw your post on the yellow+blue = AMAZING GREEN and had to write. I found this out on some of my aunt’s onionskin dyed handspun silk (she was an early hippie) and made the most delicious forest green while exhausting my first ever vat. Have just done a batch of onion skins onto unspun wool rovings – less than a plastic shopping bag of them made a huge pile of saffron gold dreadlocks – some I kept gold, but most are now gloriously green. 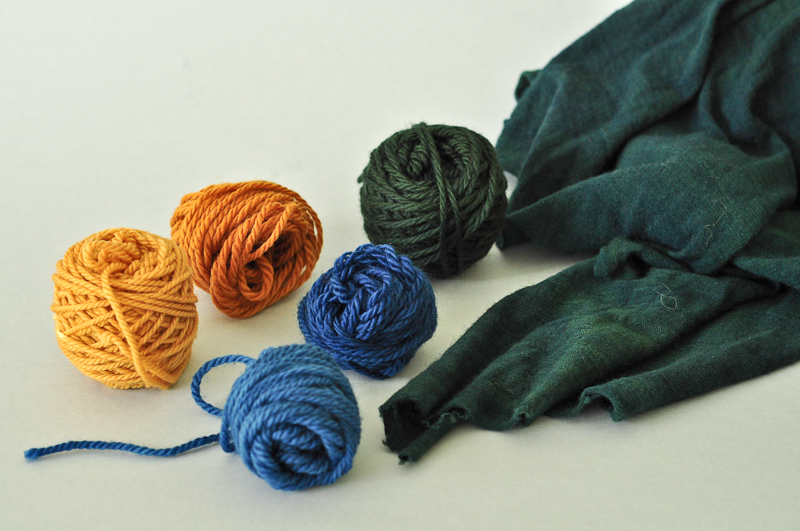 The plan is to make some dark blue russian style felt boots with green applique patterns – maybe with gold on top. 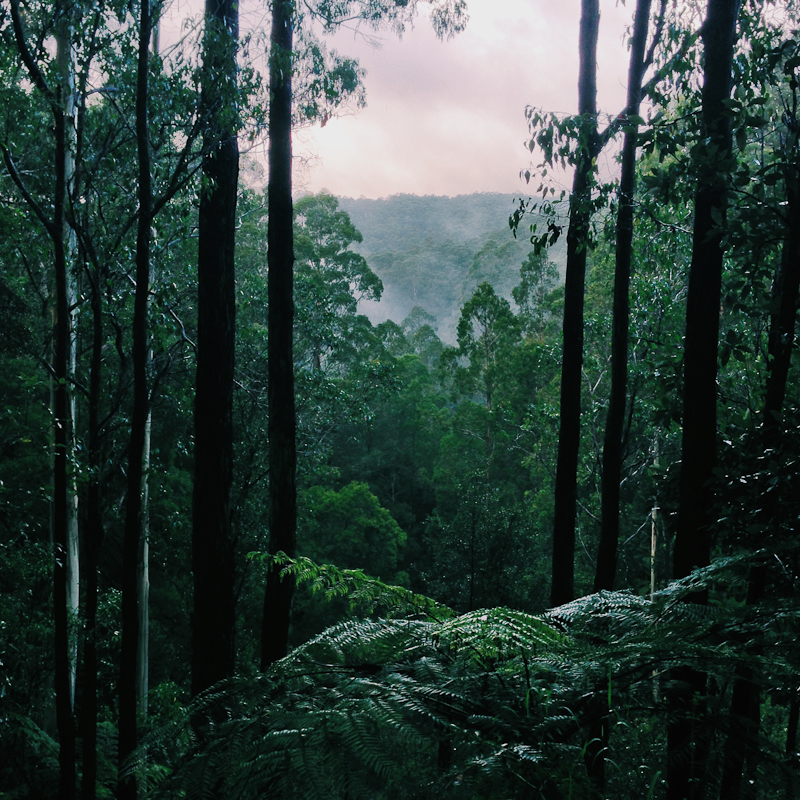 I really identified with your discovery of the hidden forest greens in our landscape – I grew up in the savannah dry north, and ached to see rainforest – but even in the gullies there were the occasional dark dark trees. Look forward to seeing more of your dyeing exploits – I’m off now to scrub my hands – wore the gloves the first 3 times, then bloody forgot on the last dip, and they were in the pot before I could stop myself. Sorry for the very belated reply! If your blue is going backwards you have too much hydros in your vat, and it is stripping the indigo out of your fabric when you do subsequent dips. give it a good stir and leave it with its lid off for 15 mins and try again. really interesting on the onion skin! i’ve never used that because i’ve read it isnt wonderfully fast, but i should give it a try anyway. I do hope you worked out your vat problems!